I don’t know about you, but I’ve always wondered what it would be like to be hypnotized. The thought of being up in front of a crowd of people and having no control sounds like an interesting experience. But imagine waking up, and everything you have ever known is different. People are acting differently, everyone’s falsely happy, enemies are now friends, and the only people who notice the difference are those who were hypnotized with you. 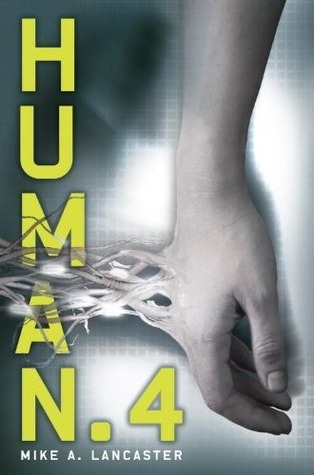 This idea is the gateway into the chilling novel Human.4 by Mike A. Lancaster, which was released on March 8th, 2011. Kyle Straker agrees to be hypnotized at the town talent show by his friend. But when he awakes, it is like reality is actually a nightmare. Every single person is frozen mid-movement, and as he and the three others who were hypnotized with him run around town trying to see if it really is everyone, things only get worse. Because, when everyone does happen to wake up shortly thereafter, they act like nothing has happened. Kyle knows better. He sets off around the town with the other three like him to try and discover why they suddenly are the only people who remember what life (and relationships) was like before this strange occurrence. Adding to that weirdness is the fact that technology, like television and computers, aren’t working any more. They just stopped and are fuzzy images of snow, or worse, nothing at all. The only thing that can be seen on the computer screen is a strange alien language that Kyle and the others don’t understand. There are a lot of loose ends and strange clues, leading Kyle on a chase to discover the truth. In some ways this was definitely an interesting book to read. The entire book is a written transcript of cassette tapes recorded by the protagonist. I liked the fact that the story was told as a recording of his account of what transpired the day of the talent show. I also enjoyed the tension as the author prolonged revealing the truth to the reader. It really does take a while for the truth to come out, and until that moment there are a lot of rabbit-trail clues planted that lead to wild speculations of what exactly is going on. I don’t want to give too much away, but the premise of the book was an interesting one, and one I enjoyed. The idea that biology and technology are essentially the same was fascinating, and really well-written. There were also a lot of thoroughly creepy scenes, due to the ignorance of the protagonist, and therefore the reader, which definitely were a highlight of the story. However, having said all that, I still felt a little underwhelmed at the end. I didn’t like the shortness of this book. I’m not sure if it is a stand-alone (from the feel of it, I believe that it is), and if that is the case, I want more. I wanted to know what happened to them after the tape. But I know that, based on the structure of the novel and the way that information is communicated, this isn’t possible. I get that. But even knowing this, the book still left me wanting to see what really happened. Granted, maybe I’m so used to reading complicated, long-winded novels that something only a little over 200 pages feels strange and too short. Maybe this was deliberate on the author’s part, to keep the reader wondering. But I personally don’t like that. You’ve written well-enough that I have connected to the characters; I want to know what happens to them. Do I regret reading this book? No, not at all. There were definitely some interesting points presented that got me thinking. But I don’t know that I’ll be re-reading this book any time soon. I’d definitely think about this one before picking it up, if you are on the fence about it. Previous postBook Excerpts from New John Scalzi & Margaret Weis Books!